This is my second and final Simplicity 7181. Time to retire this pattern. 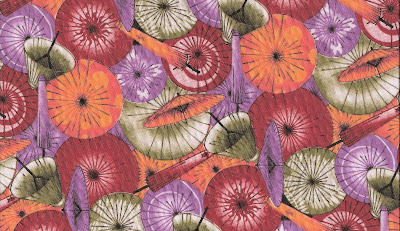 I love the cotton print which I found in my stash. I probably bought the fabric in the last two or three years, and most certainly for next to nothing on sale. The cotton is tightly woven and light and has a silky feel to it. 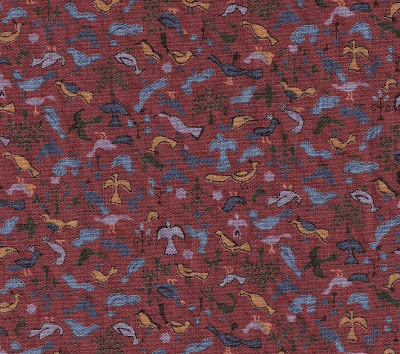 And if you look closely at the fabric swatch, you'll see tiny birds. This dress swooshes when I move. My second New Look 6352 is about halfway finished. Then I've got to work on some cards that I will be selling at a local jazz festival next month. Lots to keep me busy. This weekend I spent my time at the 14th annual Highlands of Durham Games in Uxbridge Ontario, just a short drive from where I live. Hubby has been involved with the organization of this event ever since its inception so you can imagine he was quite busy. I, on the other, hand more free time on my hands and was fortunate enough to check out all the activites such as the Scottish breed dog show, the Highland Dancing competitions and the heavies competitions to name a few. I also got to check out the vendors' stalls and found a marvellous couple who sell the kind of jewelry that I love. I'm not a fancy person so shiny, glittery stones set in gold are not my thing. I prefer semi-precious polished stones set in sterling silver and boy did she have a large selection with very (I repeat, very) good prices. I say that for the benefit of hubby in case he should read this. I'm not even sure what I bought except I can tell you the blue ring and blue pendant are lapis lazuli and the coral coloured pendant set in the swirly silver is coral. I could have bought a coral ring as well but unforunately it was too big. The vendor and I are keeping in touch by Email and she will let me know when her new shipment of coral arrives. I think these earthy colours are so versatile and can be worn with many things in my wardrobe. Just wanted to share with you. 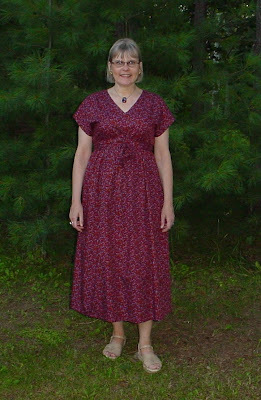 I also finished my second Simplicity 7181 dress which I will post as soon as hubby can photograph me wearing it. I cut out another New Look 6352 and will be working on that this evening. I love wearing dresses and have plans to make a bunch more. 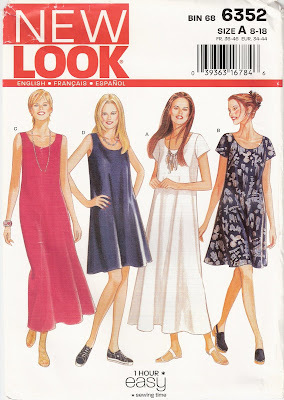 This pattern has been in the New Look catalogue since 2002. It’s a simple design which must be quite popular or else it wouldn’t still be available. I made up View C a few years ago in a pale mauve polyester silk to wear to a wedding and I quite liked it. Unfortunately, I never wore it after the wedding and it ended up as a charity shop donation. Back then, I didn’t know as much about fitting as I do now. I had cut it out in a size that ended up too big around the shoulders, but I didn’t realize it at the time. I am much fussier about fit these days. This style is loose to begin with. It’s a pullover with no zippers or buttons and it’s designed for woven fabrics which have no stretch. So you need a fair amount of ease just to get it on. This time, I again made View C, the long, sleeveless version. I like this dress for a few reasons. One, it’s simple and quick to sew up – no need to refer to the instructions. Two, it’s open around the neck – very breezy for these hot, summer days. Three, it hides figure flaws if you have them (and I have them. Too many fat filled restaurant meals while I was on my trip has obscured my waist line). I sewed this dress in a poly/cotton “seersucker” blend. It’s lightweight and cheerful and makes me feel the same. The necklace I am wearing was a present from my very thoughtful hubby. Unless it turns out to be a real wadder, I tend to sew a pattern more than once. 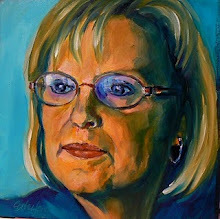 I think I’ll have another go at this one too before I put it away. I was not particularly happy with this dress when I finished it last night. It was huge on me and reminded me of a night gown. How could I wear a thing like that in public? As I was lying in bed, I thought about how to fix this "mess". I decided the quickest solution was to make a long self tie belt and wear it just under the bust, the slimmest part of my anatomy. Well, what a difference a little belt makes. Now I love this dress and wore it proudly all day. This has happened to me many times. I finish a project and I don't like it. Then I give it a day and see it in a whole new light. As long as the pattern pieces are still out, I will definitely make one more and then move onto something else. The silhouette floral skirt I wrote about a few days ago is almost done. It needs a hook and eye closure on the waistband and a hem. I have the ruffle ready for the matching black petticoat but discovered I don't have enough black broadcloth for the skirt part. So, a trip to the fabric store is required before I can make the petticoat. In the meantime, I've decided I want to wear a dress to an event hubby and I are going to tomorrow. There isn't much time, but I'm pretty sure I can get it done by noon. 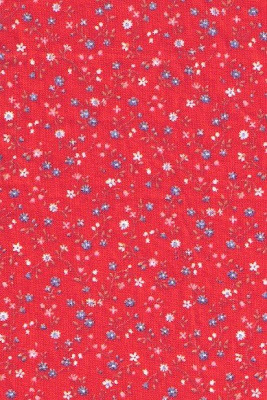 I've had the pattern, Simplicity 7181 for a while and my friend, J, gave me 3 metres of fabric that she got for next to nothing in a thrift shop. If it turns out OK, then I'll whip up another one with some fabric that I've actually shelled out some bucks for. Pictured above is the view I am working on and the fabric. I'll be wearing the dress with bare legs. This morning I got out the self tanning lotion. Already my legs are looking orange which is far better than the usual white. Perhaps another application tonight and I'll be good to go. More about the dress to follow and if it looks good on me (with sewing you never really know ahead of time), I will model it for you soon. Pictured above is the image for my latest greeting card. I had to take a lot of photos to find some decent light. This was taken outdoors under the huge pine tree in front of my house. I love the way the sunlight filters through the branches. I may have to try for another shot under different lighting (maybe early in the morning) as I'm not sure this image is clear enough. I'll have to get Wal-Mart to print it out for me and see how it looks against some really cool cardstock that I recently purchased. The silhouette floral is from some fabric I bought a while ago. I have almost finished an A-line four gore skirt out of this fabric with just the waistband and hem to do. Instead of lining the skirt, I am going to make a half slip/petticoat with a black ruffle. I'm looking forward to sharing that with you in a couple of days. I am targeting to get it all done by the weekend. Today was supposed to be a day devoted to working on greeting cards, however, have you noticed that things do not always go according to plan? In the morning, I had to help hubby with some business stuff. Then a storm hit and before I knew it, a huge tree in my neighbour's yard broke off at the top due to heavy winds. Fortunately, it only blocked my neighbour's driveway and the street. We're thankful that the two parked vehicles nearby were far enough away to avoid damage. And no person was hurt. And our favourite neighbourhood cat, Lucy Maude, was away from the site (she dropped by later to check things out). Just a mess to clean up. Hubby got out the old chain saw (guys do love their chain saws) and cut the branches and limbs into manageable pieces while my neighbour and I hauled them to the side of the road. We cleared the drive and road but a pro will have to come in and take down the tree. Afterwards, we sat down and had some beers and traded travel stories with my neighbour. She was away visiting family in Birmingham, England while we were on our trip. So that was a little bit of excitement in our neck of the woods today. Tomorrow is another day and I will try again to work on some cards. I stitched up another simple top from New Look pattern 6362, the same top I made before I left for my trip. The pattern pieces were still scattered on my sewing table so I thought before I put them away, I would make another one and then move on to a new project. I used a lightweight cotton calico from my stash. Tomorrow I will be working on "Thank You" cards to send to all the folks who were so kind and generous to us while we were in Estonia and Scotland. And, if I have time, I may cut out a skirt. Above is a heavyweight cotton manufactured in Estonia. Because of our busy schedule, I was lucky to find time to seek out two fabric stores. I tend to favour smaller prints. This print is very large. In fact, I didn't have very much choice of small prints, so I went with this one because I love the bold colours and floral design. Same print as above but in a different colour configuration. This is a heavy cotton duck I bought in Estonia. I'm not sure if it was manufactured there. I forgot to ask. I love the sailboats and see this as a possible spring jacket. And now on to the purchases in Scotland. These two beautiful lightweight cotton tartans (Dress Stewart on the left and Royal Stewart on the right) were really expensive, at least for a bargain hunter like myself. But authentic tartans in cotton are hard to find in Canada, so I thought I better snap them up while I had the chance. Hubby thought they were a good buy but then he's Scottish and subscribes to the "If it's no Scottish, it's crrrap" philosophy. This is a quilting cotton manufactured in England. I am currently into the colour brown. And another pretty delicate cotton design in brown. I think this was made in America. I also bought some printed linens by the metre in Estonia which I didn't photograph for this blog entry. I will be making tea towels from them. I still wash my dishes the old fashioned way (I don't like dishwashers) and linen towels are the best for drying dishes. My next projects include another top and a thank you card to send to all the wonderful folks in Estonia and Scotland who did so much for us and made us feel so welcome. I will be posting a few photos from the trip as soon as I can get them from my sister. She and her hubby took hundreds of pictures and she said I could share a few here. Just a brief entry to let my reader's know that I am back from my trip to Estonia and Scotland. I am too tired to write much today. I bought some fabric from both countries which I will write about soon. Pictured above is a photo taken at my family's burial site in Estonia, where my younger sister and I delivered our father's ashes back to his native country for burial. This was his wish. From left to right is our Estonian born half-sister, yours truly, my Canadian born sister, and my aunt, dad's only surviving sibling.